https://sep.yimg.com/ay/yhst-33477391359232/golden-basslet-assessor-flavissimus-yellow-assessor-basslet-9.jpgGolden Basslet - Assessor flavissimus - Yellow Assessor Basslet ModeratePeaceful20 Gallon2.3 inchesYesCarnivore, Feeder Shrimp, PelletWestern Central Pacific, Great Barrier ReefGrammidaeSmall 1" - 2"
The Golden Basslet is the most reef safe and peaceful fish in the industry. It is more likely harassed than the one causing the harassment. This fish prefers overhangs and caves. Will often be seen hanging around upside down against walls, overhangs and caves. Prefers less light and may come out more after the bright day lights turn off. This fish is happiest in a very peaceful reef setting without any large fish. This attractive and peaceful fish comes very highly recommended. Due to the availability of this specimen, please call before ordering as it is not frequently available. Very similar is the MacNeils Basslet. 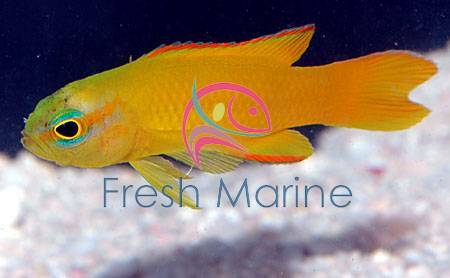 The Yellow Assessor Basslet, also known as the Golden Mini Grouper or Gold Basslet, is entirely yellow with red outlining the fins. It may often be seen swimming upside down. For a single Golden Basslet, provide at least a 30-gallon tank � larger for more individuals, and plenty of rock caves for hiding. It is best to keep only one male Golden Basslet in a single aquarium since he can be aggressive and territorial. These fish are generally peaceful towards other species. The Golden Basslet will not bother invertebrates making it an excellent choice for reef aquariums. Maximum Size: The Golden Basslet grows up to 2 inches. Minimum Tank Size Suggested: The Golden Basslet prefers a tank of at least 20 gallons with plenty of places to hide & swim. Habitat: Golden Basslet are found near Coral Sea, and Fiji. Feeding and Diet: As a carnivore, the GOlden Basslet will thrive on a diet of meaty foods such as finely chopped fresh or frozen marine fish, squid, mysid shrimp, vitamin-enriched brine shrimp, and frozen carnivore preparations. Feed at least twice a day.